General Information: This mild stage of garlic is generally available from March to May. Green Garlic is a spring culinary treat that does not receive as much fan fare as it deserves. Green garlic are the fresh shoots of the immature garlic plant. In spite of its many culinary uses, green garlic seems to be one of the best kept secrets in the realm of allium sativum, at least outside of Asia where it is a key cooking ingredient. In general green garlic can be used in any recipe that calls for mature garlic. The end product will produce a delicate flavor, more mild than matured raw garlic. 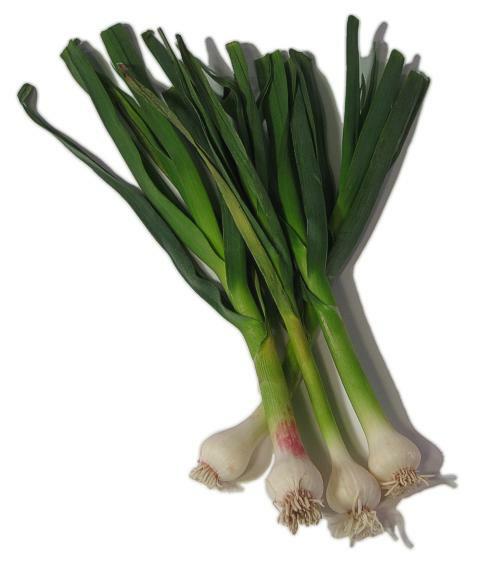 Applications: Green garlic can be used like scallions, chopped in salads or in stir fry dishes. Braised they make an elegant garnish with steak, fish or chicken. Another favorite is poached salmon with a ginger-lemon sauce garnish with braised spring baby garlic. They can also be served as a side dish a la braised leeks. A variation on this theme is to saute them in white wine with loads of chopped garlic cloves. Or to add an oriental twist, reduce the pan liquids and add soy sauce for an exotic explosion of garlicky flavors.